SAN ANTONIO - Two Brightwood College campuses in San Antonio have closed their doors, greeting students who arrived Wednesday morning at the campuses with locked doors and leaving them with more questions than answers. Several viewers and people on social media reached out to KSAT to report the closure. A student told KSAT.com it was her "first day of (her) last quarter studying for vocational nursing." "I would have been graduating March of 2019 after starting at Brightwood College on Jan. 31. Credits from here are not transferable (and) only a few schools take some credits. I will have to be starting all over again after being so close to finishing," the student told KSAT.com. Melissa Zavala, who was attending Brightwood College at the San Pedro location to become a medical assistant, said she was in class Wednesday morning when campus officials broke the news. "It was weird because we went to class and then they took us to the auditorium and the director was there and she was like, 'I have bad news. The school is closing down,'" Zavala said. "Everyone was like, 'What about our student loans? We're almost done.'" Zavala said campus officials could not give them any other information and told them to "Google" other campuses they could attend with the assumption their earned credits may not be transferable. "We worked so hard these past few months. They did not even let us know (and) at least tell us they were going to close down," Zavala said. "It's like a fraud: they took our money, they shut the school down and that's it for us." Sean Raven, director of admissions at the San Pedro location, said they learned of the abrupt closure around 8:15 a.m. Wednesday. "We've been limited on information. As of right now, our main concern is our students -- just trying to make sure that they are taken care of and they're continuing their education," Raven said. The closure comes less than two months when Education Corporation of America filed a lawsuit against the Department of Education in an attempt to keep its access to federal student aid. The lawsuit, however, was later dismissed, Inside Higher Ed reported. Education Corporation of America, which owns the for-profit chain of Brightwood Colleges, announced earlier this year it was expecting to close dozens of campuses by 2020. Inside Higher Ed reported in September that the company was anticipating to shut down at least 26 campuses across the country and it was "ending enrollment of new students at those campuses immediately because of insufficient demand." 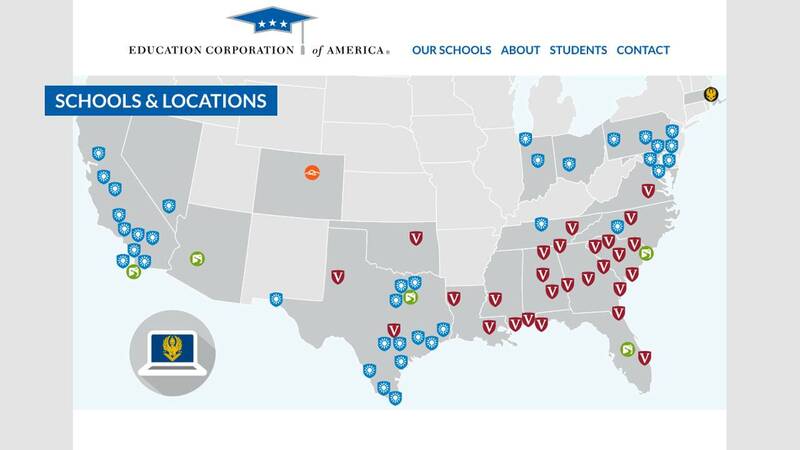 On Wednesday, Education Corporation of America revealed it was closing all of its campuses and notified employees their positions were going to be eliminated, Inside Higher Ed reported. According to Inside Higher Ed, Education Corporation of America owns more than 75 campuses under the names Brightwood College, Brightwood Career Institute, Virginia College, Culinard, Ecotech Institute, Golf Academy of America and New England College of Business, and enrolls at least 20,000 students. For more information, click here to visit Education Corporation of America's website. Students who were enrolled at the affected campuses may be eligible for their loan to be discharged. Click here to visit the website. "After many years of training students for new careers, it is with a heavy heart that today we announce that Education Corporation of America (ECA) is closing all its career colleges effective with the completion of the current module or term for most students. We will work with students to ensure access to their transcripts so they can complete their studies at another school. We are proud of our thousands of graduates who have entered the workforce with skills they acquired at our schools along with our faculty and staff who have shown unwavering support for our students. This is not the outcome that we envisioned and is one that we recognize will have a dramatic effect on our students, employees, and many partners."